The Roman society, like most other ancient societies, was divided into various social classes, and like every other domain of life, this class consciousness of the Romans was also reflected in their houses and homes. Rich people and wealthy freedman had elaborately constructed large houses while the poor people lived in small quarters or apartments. People from the upper classes were known as Patricians while those belonging to the lower classes were called Plebeians. 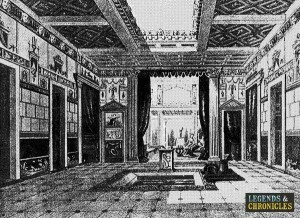 The patricians lived in grand houses with impressive architecture while the plebeians lived in simple houses and homes. Different housing styles and designs were used in ancient Rome for people belonging to different social classes. People from the lower classes lived in small houses or flats which had two rooms at most which were mainly reserved for sleeping. Roman people usually ate at local inns and visited local public baths for washing. The rich people, on the other hand, mostly had large single-storey houses built around a central hall called an atrium. There were many large and well-furnished rooms in addition to private baths. An important feature of the houses of the rich people was an open courtyard known as a peristylum. It consisted of a garden that served as a meeting point. 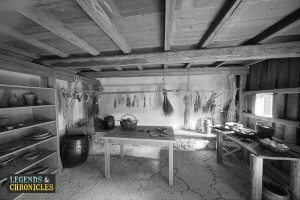 An ancient Roman farmers kitchen. The houses of the poor people were generally built with such materials as timber, mud brick, and primitive form of concrete. These were not very strong houses and were often prone to fire and collapse. Building materials used in the large homes of the rich varied significantly. For temporary structures, wood was the preferred material. During the early times of Roman Republic, stone and unburned brick was extensively used for permanent buildings. Additionally, fine white marble stucco was used as a decorative covering. Waterproof lining for cisterns was provided with cement combined with crushed terracotta. Concrete walls faced with stone or burned bricks were known as ‘opus incertum’ for irregular sized stones and ‘opus reticulatum’ for regular sized stones. These structures of the houses of elite class were very durable and prone to water and fire. The building techniques used for the construction of ancient Roman houses evolved with the passage of time. The earliest houses were built having walls with irregular shaped stones. With the improvement in stone cutting techniques, stones of uniform size began to be used. A very effective kind of mortar was developed by the ancient Romans made by mixing volcanic ash with lime. The mortar developed this way was resistant to water and was extensively used for construction works. At the later stage, the use of concrete became important for construction. This was known as ‘opus caementicium’ and was laid into timber structures where it hardened and resulted in very solid walls. The technique of fired bricks was also important and was perfected during the first century AD. A visual representation of the inside and impluvium of a Roman domus. Family was the primary social unit in ancient Rome and the male head of the family had absolute authority in public and private affairs of the family. But the running of the household affairs was the domain of the wife and it was also she who looked after the education of the children. During the early days of Roman Republic, the wife was not allowed to appear in public but this changed as time passed. Eventually, the wife could go to baths, accompany her husband at dinners, and also attend theatres and games. A good part of the day for the husband was spent working while the wife took care of the household chores. During the later years of the republic and throughout the empire, women could also work in various professions. The ancient Roman houses of wealthy Romans were called ‘Domus’ and were found in almost all the major cities throughout the empire. Additionally, rich families generally had a country home as well which was known as villa. The Domus of the rich people consisted of multiple large rooms in addition to indoor courtyards and gardens. The large central hall was known as an atrium and had beautifully painted walls, sculptures, and statues of ancestors and gods. The dining room was called ‘triclinium’ and consisted of couches where guests could recline and have dinner. Other parts of ancient Roman houses for the rich people included ‘cullina’ which was the Roman kitchen, ‘cubicula’ meaning bedrooms, and a ‘tablinum’ which was a living room or study. The grandeur of the palaces of ancient Roman emperors increased with the passage of time after the founding of the Roman Empire. The primary residence of the first Roman Emperor, Augustus Caesar, was called the ‘House of Augustus’ situated on the Palatine Hill. At the initial stages, it was a modest residence but increased in size and grandeur over the reign of the subsequent emperors. Eventually, during the Flavian Dynasty, a large palace was built on the Palatine Hill which had many large rooms and suites of rooms. This palace was extravagantly decorated and also had courtyards with fountains. A Roman Domus or house, showing the various areas of this type of home. The Roman Empire was a military empire that was constantly expanding and therefore the Roman military remained mobile most of the time. Due to this reason, temporary residences were needed for the soldiers in the form of leather tents occupied by multiple soldiers at the same time. While in Rome, the soldiers lived in modest homes but generals had large houses just like the wealthy Romans. Most of the generals hailed from the aristocratic class and also possessed countryside villas. 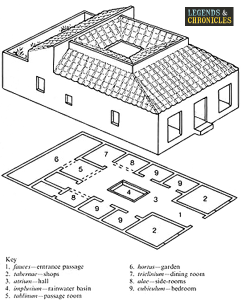 Ancient Roman houses mainly fell into two classes of Domus and Insulae. The Insulae were the houses of the poor people which consisted of one or two rooms mainly used for sleeping purposes. These houses were not very well protected against fire and water. The houses of the rich people, on the other hand, were large structures built with proper planning. The rich people also had country villas which were even larger than their town houses. Various construction techniques were used to build ancient Roman houses and these techniques evolved with the passage of time.